The Tiger shark is the biggest predator in Cape Verdean waters apart from the blue marlin. The tiger shark is found throughout the world's temperate and tropical waters, with the exception of the Mediterranean Sea. It is a wide-ranging species that is at home both in the open ocean as well as shallow coastal waters. Reports of individuals from as far north as Iceland and the United Kingdom have been confirmed but are probably a result of roaming sharks following the warmer Gulf Stream north across the Atlantic. 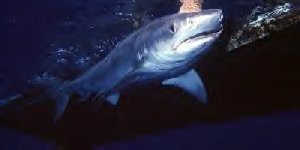 Tiger sharks undergo seasonal migrations. It is well known that they move into temperate waters from the tropics for the warmer months and return during the winter. These sharks also make long oceanic migrations between islands and are capable of travelling long distances in a short time. Probably the easiest shark to recognize, the tiger gets its name from dark black spots and vertical bars which run the length of the body. The fore body is stout but becomes slender behind the abdomen. The tiger shark has a large head and eyes with a blunt snout. The mouth is large with furrowed lips. It has a broad dorsal fin with a small second one behind. It has a ridge between the two. The tail fin is long and thin. Its colours are blue-green to dark grey or black dorsal surface with a yellowish-white to stark white underbelly. The characteristic dark spots and stripes are most prominent in young sharks and fade as the shark matures. The tiger shark has very distinct and large teeth with curved cusps and finely serrated edges. Each tooth has a deep notch on the outer margin. Teeth get smaller towards the back of the mouth. The least discriminating of all shark it has a reputation as a trash-can. Prey depends on what it finds but includes turtles, rays, other sharks, fish, birds, dolphins, squid, and shellfish. The tiger shark's highly serrated teeth combined with the saw-like action from shaking the head back and forth allows it to tear chunks from much larger marine animals. Objects of human origin are found in its stomach. One large female caught off the north end of the Gulf of Aqaba in the Red Sea contained two empty cans, a plastic bottle, two sacks, a squid, and a fish. Garbage and refuse is often recovered from the stomachs of sharks caught in harbours and estuaries. Tiger sharks are solitary hunters that feed primarily at night as the shark moves further inshore and closer to the surface. Tiger sharks are sometimes seen in groups but only due to food concentration. The tiger shark is second only to the white shark in number of reported attacks on humans. Its large size and voraciousness make it a formidable predator in the ocean. Tiger sharks can be curious and aggressive towards humans in the water and must be considered with a great deal of respect. Both commercial and recreational fishing catch rates for this species in the mid-Atlantic region have declined since the mid-1980's as fishing pressure has culled it. Most recent catch rates for this species,especially for juveniles, have recovered. But the World Conservation Union (IUCN) lists the tiger shark as "Near Threatened" throughout its range.